Effective August 1, 2014, Tulane campuses are 100% tobacco and smoke-free. Smoking, and the use of all tobacco products, including e-cigarettes and vaporizers, are prohibited on all university property, either owned or leased. Through tobacco-related research, public awareness, and policy change, Tulane University has promoted the public health of its community. The newest tobacco policy has received the support of the Tulane community, passing unanimously through Tulane University Senate in April 2013 as well as receiving official backing from USG in April 2014. This change in policy reflects the Tulane community's change in both knowledge about and attitude towards tobacco products. It is important to note that the policy includes parking lots, sidewalks and all university leased or owned vehicles. Public rights-of-way are NOT included and therefore are places where tobacco products may be used, such as sidewalks on St. Charles Avenue, Freret, Willow, Broadway, and Claiborne Avenue adjacent to Tulane's Uptown Campus. Tobacco is an important issue for all those on campus, whether they are students, faculty and staff or visitors. While one-third of college students have experimented with cigarettes**, those who have not are also negatively affected through second and third-hand smoke exposure. Because of the toll tobacco takes on the health and well-being of our community, Tulane is joining schools and universities across the nation in taking a stand against tobacco use and nicotine dependence by implementing a 100% tobacco-free campus policy for all university-owned properties. As part of the Tulane community, we can all help in successfully implementing this policy, which is a benefit to both smokers and non-smokers alike. Just by following the policy guidelines as well as spreading the word and helping others understand the policy, we can bring healthier air to all. *Electronic cigarettes and vaporizers are prohibited in this policy as they are nicotine-containing devices that are not approved by the FDA as cessation devices. For consistency and enforcement purposes, electronic cigarettes and vaporizers that do not include nicotine are prohibited in this policy as well. **American College Health Association. (ACHA). (2013). National College Health Assessment II (NCHA-II). It takes the average tobacco user seven tries to quit using tobacco products for good. If you have tried before unsuccessfully, view it as practice for your final quit. Research shows that the earlier in life a person quits, the less difficult the process and the lesser an impact that tobacco use will have on their health. Tulane's Tobacco and Smoke-Free Community Policy requires that all faculty/staff use tobacco off campus if they do decide to continue using tobacco. UnitedHealthcare offers coverage for tobacco cessation counseling. Contact UnitedHealthcare for more information. 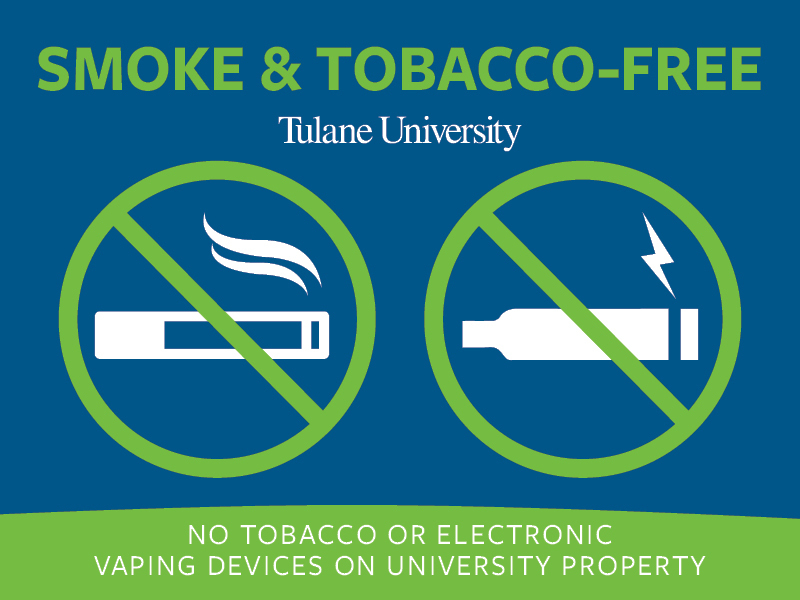 Tulane University is a smoke and tobacco-free community. This means cleaner air for everyone. To remain in compliance with the policy tobacco users may need to reduce their consumption of or quit using tobacco products. Tobacco Users in Louisiana who began smoking prior to September 1, 1988, are eligible for special tobacco cessation benefits through the Smoking Cessation Trust.